...and on her Masters in Divinity and meeting Oprah. Truly inspirational. Cindy was the opening Conversation Starter for Heartland (now CPL's) 20th Anniversary Celebration last October. She continues to amaze us. She spoke with MassDevice.comPublisher Brian Johnson at the DeviceTalks event in Minnesota recently about her skills as a leader, how she ended up as an ordained minister and the importance of inclusion and mentorship in the workplace. And, how she met Oprah! 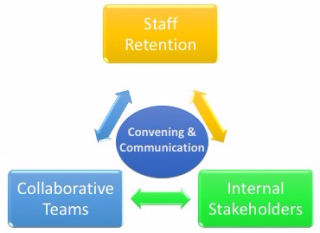 How Are Internal Stakeholders and Team Performance Connected? For the past few months, a group of senior managers, mostly women, have been meeting to re-organize an internal group of stakeholders. The quandary they were facing was retention of top female talent in a male-dominated workplace. By re-energizing the workforce through a special interest group (SIG) they hoped to curb the exit of female staff. This SIG hired Center for Purposeful Leadership (formerly Heartland) to re-focus the mission and vision, design a kick-off meeting and provide convening training. Over a period of five months, the design team met monthly. The SIG leadership team, along with key HR staff, took the Art of Convening workshop to learn effective communications and staff engagement techniques. After the training, the SIG leadership team applied the meeting design principles to the re-launch kick-off with great effect. The SIG relaunched in March with over 70 people in attendance - double the expected turnout! With the SIG firmly in place and staff reengaged - both men and women - employees are seeing one another in a new light, taking time to collaborate and supporting one another professionally. The internal stakeholders in the SIG have acted as champions for the organization and teams have transformed. Looking back on these past months with the client, they benefited from executive coaching and training on more effective meetings, and exceeded their goals and expectations. Now that the SIG is up and running, they have requested a quarterly tune-up. You may think of tuning up cars on a periodic basis, but how about teams? Consider tuning up your team or a special interest group. Quarterly trainings and monthly coaching enable staff to embody positive business practice adaptations - for the long term. Dear friend Peter Block was the Conversation Starter at our Thought Leader Gathering in San Francisco on 9/12. An exhuberant participant writes about her experience : "Well, Istarted with "WOW" on Friday and I ended with "wow" Friday and I'll just start there again today!! First and foremost, thank you so much for the gift of all your hard work and insightful design with your entire team including the incredible Peter! It was such a full, rich, powerful day done in the spirit of risk of trying something new... The biggest gift of all was the powerful end of the day-the acknowledging of our gifts...it is such a hard thing for me and I so needed to learn from that ah-haa moment of grace for myself." ~A distinction related to community – transformation vs. change: Transformation is changing the nature of things; Change is making things a little better. ~You’re involved in the work of transformation, changing the nature of what we have today. A culture based on dominance, a “I know and you don’t attitude,” which is the high control, patriarchal narrative. The master narrative is to find conflict, controversy and rev it up. ~There’s a political element to building community – not just be among friends, but to shift the narrative in which this country functions. It’s too big for me to really grasp myself, but change is too small a God to worship. ~Community requires an act of leadership – the courage to step forward to imagine another world. Not management, which is to give order and structure, but that doesn’t create anything new. It gives order and predictability, and most of us will sacrifice our freedom for predictability any days of the week. ~Safety in response to the culture of fear – as long as we’re convinced it’s dangerous out there we will trade our sovereignty for the promise of safety. Leadership is a convening task of bringing people together in a way that changes things. That’s why the arts matter. The arts understand the nuances of experience – they tune us in to see the world in a different way. That’s the work – creating something we’re unaccustomed to. ...more to come in the write-ups later this week! The Heartland home page states: "Experience the power of onemultiplied by the power of many" as an offer and invitation. Why is this so important? Excerpts from a newsletter I receive, called the Daily Om, explain eloquently why we must gather— either in person or virtually—to create an exponential effect. "Like tiny ripples that merge to form great waves, combined human intent is worth more than the sum of its parts. Alone, the light you emit is a wonderful healing tool, but when you join with others who share your intent to shine compassion and positive energy over the world, a powerful force is created. Each person's light joins with every other, and through the joining all are strengthened. What matters is not technique or what religion or beliefs you hold, but intent. As you gather together willing people, your individual intent will become a great and powerful wave, and you will see results in your fellow humans, in the news, and in your daily life."